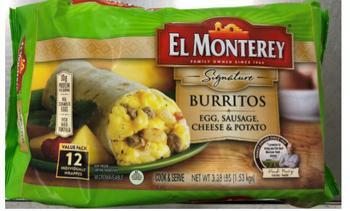 Ruiz Food Products of Denison, Texas, is recalling approximately 50,706 pounds of frozen breakfast burritos. The product may be contaminated with extraneous material, specifically white, semi-rigid plastic pieces. The recalled product, bearing establishment number “EST. 17523A” on the back of the packaging, was shipped to retail locations nationwide. Consumers with questions about the recall may contact the company’s consumer line at 800-772-6474.